Your deadline creeps closer with every tick of the clock. You ruffle through your notes one last time, trying to find one stone of information left unturned — nothing. Panic sets in. All you need is a little bit of Wikipedia knowledge. Why not? No one will know. Halfway down the Wiki page you see the perfect paragraph to finish your story. Less than a minute to deadline: no time to reword. Two clicks later — good friends copy and paste — part of the Wiki article is nestled in your copy. Deadline made. Excuses fly when journalists are accused of plagiarism: sloppy notetaking, being overworked, “I didn’t mean it”, and any variation of these. No matter the excuse, it’s the news outlet’s responsibility to respond to the accusation. A lack of consistency in both defining and dealing with plagiarism has led to the sin becoming an ethics Hydra. Just when you think you’ve wrangled one of its issues, two more crop up in its place. And what is seen as plagiarism in one newsroom may just be a shortcut in another. “Too often the P-word has been used to describe activities that are not serious violations,” says Roy Peter Clark, the Poynter Institute for Media Studies’ vice-president and senior scholar. For Clark, the intent to deceive readers is what separates plagiaristic misdemeanors from felonies. 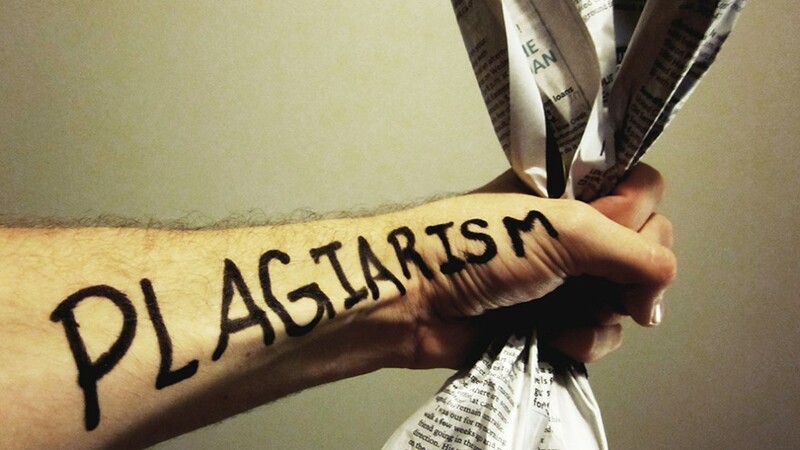 He says real plagiarism is when “fraud is intended”; sloppy attribution doesn’t fall in that category. At the same time, “I’m reluctant to accept the idea that a writer can unintentionally plagiarize something of any length,” he says. Our Wikipedia thief may not reach fabricator-level pariah, but he’s definitely a close second. Plagiarism can be used as journalism’s vacuum term for anything that has to do with attribution confusion: from a long-lost footnote to blatant copy and paste. But at its sly, conniving heart plagiarism is taking someone else’s work and presenting it as your own. It’s no secret: traditional newspapers aren’t the money-makers they once were. In April 2015, the Pew Research Center released its State of the News Media 2015. The Washington, D.C. think tank’s annual report shows a triple threat to traditional newspaper economics: circulation numbers, ad revenue and the number of newsroom employees are all plummeting. Meanwhile, the 24-hour news cycle monster demands to be fed more content than ever before. “There’s definitely a lot of additional stress on your frontline reporter,” says Jonathan Bailey, creator of Plagiarism Today, a New Orleans-based blog dedicated to educating the public about online plagiarism. Bailey says at the beginning of his career as a journalist, he was expected to write three feature-length stories — between 500 and 1,000 words — a week. “That’s nothing today,” he says. “Your average journalist at a newspaper is probably writing three or four a day when you factor in online media, print and everything else they’re doing.” Bailey says that the pressure to produce makes reporters take shortcuts that often hurt the quality of reporting. In 2014, BuzzFeed fired Benny Johnson, one of its most popular writers, after two people known only by their Twitter handles, @blippoblappo and @crushingbort, accused him of plagiarism. Publications including the Washington Post, Politico and Gawker reported that the pair, which created Our Bad Media — a media watchdog blog — had many examples of Johnson plagiarizing from questionable sources like Wikipedia and Yahoo! Answers. That wasn’t the first time a blogger called out a reporter for plagiarism. In 2012, Carol Wainio accused the Globe and Mail’s Margaret Wente of plagiarism in a column she wrote three years earlier. The Globe’s response was lacklustre. Wente defended herself by claiming she was a victim, “a target for people who don’t like what I write.” Sylvia Stead, the newspaper’s public editor, published an article reducing Wainio to “an anonymous blogger” and the accusations to having “some truth”. The result? An editor’s note was added to the electronic archive. Many journalists thought the newspaper was trying to protect its prized columnist. Earlier in 2012, the public played a large part in journalism-wonderkid Jonah Lehrer’s demise. Lehrer was a rising star in science journalism; his pieces appeared in publications including the Wall Street Journal and the New Yorker. “His downfall was sort of crowdsourced,” says Andrew Seaman, a reporter for Reuters based in New York City. Once Lehrer was outed for self-plagiarism, Seaman says the public started keeping a close eye on him. This scrutiny led to Lehrer being exposed for fabricating Bob Dylan quotes in his book Imagine: How Creativity Works. “That type of presence can be very, very valuable if done well,” says Bailey. “But, it takes a very dedicated person to pull that off.” But the fickle nature of the crowd usually means it’ll release the alleged plagiarist from its grip prematurely or jump the gun and become premature prosecutors. More tools used by a media-savvy audience unafraid to apply pressure on any newsroom: this is the blueprint for a plagiarist-catching machine. What to do once you have caught one? “It’s one of those things where we don’t really have a good system to handle (plagiarism),” says Andrew Seaman, the SPJ’s ethics chair. In 2014, the SPJ updated its Code of Ethics and expanded its stance on plagiarism to four words: “Never plagiarize. Always attribute.” The statement leaves little room for ambiguity on what not to do, but there’s nothing about responding to cases or even what makes up plagiarism. 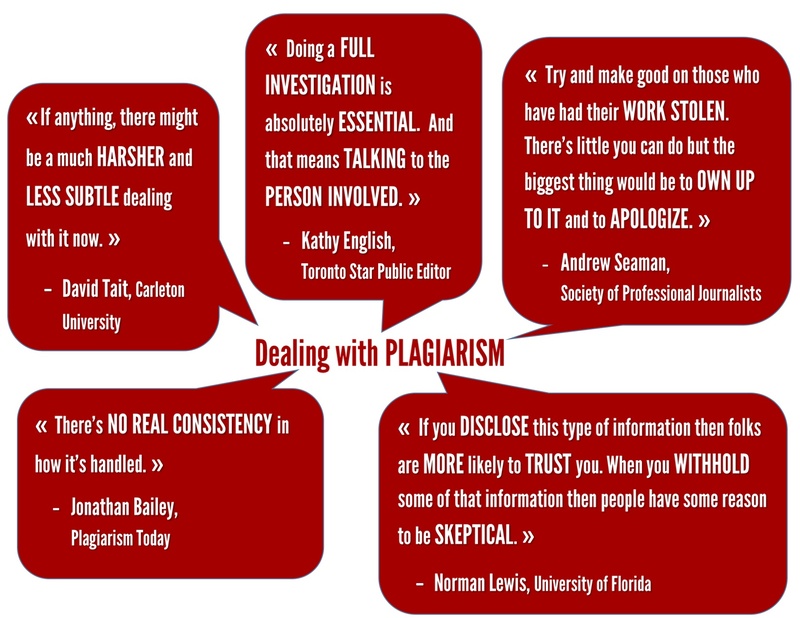 Seaman admits the SPJ should develop guidelines, or best practices, to help respond to plagiarism accusations. The first step: take an accusation seriously. “Doing a full investigation is absolutely essential (…) and that means talking to the person involved,” says Kathy English, the Toronto Star’s public editor. She says she can count on one hand the number of plagiarism cases at the Star that she’s dealt with during her eight years on the job. Consistency and transparency, as always, are the key to building trust with readers.